DAY H E WROUGHTON - SWINDON, THIS IS SWINDON. This particular Wiltshire ginger beer bottle from the village of Wroughton which is just to the south of Swindon is a bit of an enigma. Having searched Trade Directories, Newspapers and other likely sources of information I have not yet found any direct reference to this manufacturer or company. There is, however, one possible candidate whose family details I have only so far found in census returns and the GRO birth, marriage and death records. It is my view that this was a very short lived enterprise and I believe the proprietor was Henry Eli Day. Henry, the son of George and Mary Ann Day had been born in East Hagbourne, Berkshire in 1874. His father died at the age of 33 years in 1878 and in 1879 his mother married Josiah Warwick. In the census of 1881 Henry is living with his step father who is a general labourer, mother and half brother Frederick in Bakers Lane, East Hagbourne. By the time of the 1891 census there had been a move to Highworth in Wiltshire and Henry, now a 17 year old farm labourer, is living with his family in Lechlade Street. In 1896 Henry married Elizabeth Harriet Maria Taylor who is shown as Harriet Maria Elizabeth Taylor in the GRO marriage index. She had been born in Monmouthshire in 1877 although in the census for 1911 her place of birth is mistakenly given as Wanborough, Wiltshire. She had in fact been living with grandparents in Wanborough prior to her marriage. In 1898 daughter Mabel Elizabeth Day was born in Highworth. The 1901 census finds Henry and Elizabeth with 2 year old daughter Mabel living at 2 Wells Street, Swindon. Henry’s profession is now given as a Confectioner (corrected to Baker by the enumerator?) working on his own account. Henry Mornington Day born in Southampton, Hampshire in 1906 and Kempton Roy Day born in Southampton in 1909. In the census of 1911 there is mention of another child, George Day, who had died but I have not yet been able to establish his details. A complete change of location and occupation has occurred between the 1901 and 1911 census‘s. In 1911 Henry, whose occupation is now given as a groom, is living at 68 Denzil Avenue, Southampton with his family. It would appear the move was made at sometime between the birth of daughter Ivy Florence Day in Wiltshire in 1902 and that of son Henry Mornington Day in Hampshire in1906. So far I have not yet been able to establish what happened to Henry after 1911. His wife died in Lancashire aged 46 years in 1924 which was shortly after the deaths of two of the children, also in Lancashire, Ivy Florence Day aged 18 years in 1921 and Kempton Roy Day aged 13 years in 1922. All three deaths were registered in the Fylde, Lancashire registration district. I have not found Henry Eli Day in either the 1898 or 1903 Kelly’s Directories of Wiltshire but he does appear between these years in the census return of 1901 as a Confectioner/Baker working on his own account. His address was given as 2 Wells Street in Swindon which still exists and is a typical late Victorian terraced property. Although it is possible he could have been working from home it does not seem likely given the type of property it is so his place of business is still as yet unknown. 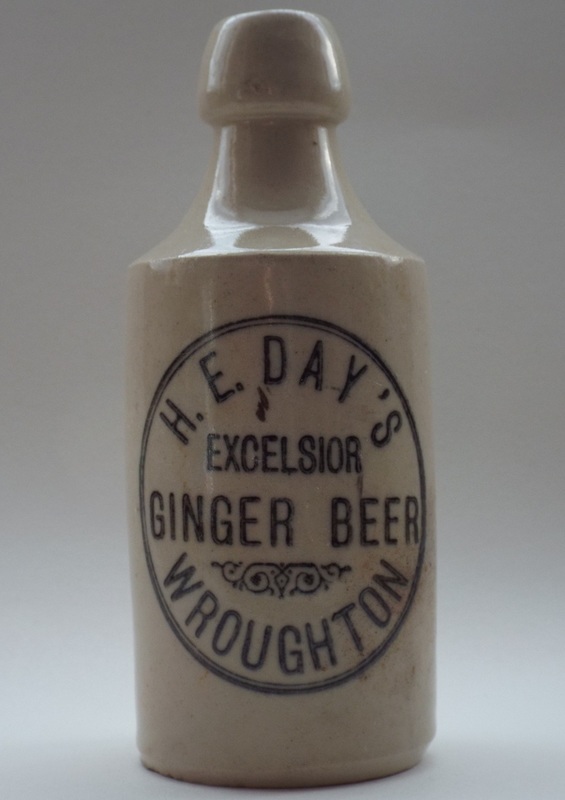 There are many examples of Confectioners also producing or retailing ginger beer as part of their business and although it is only circumstantial I believe it is probable that Henry was doing the same for a short period at sometime in the late 1890’s to the very early 1900’s.